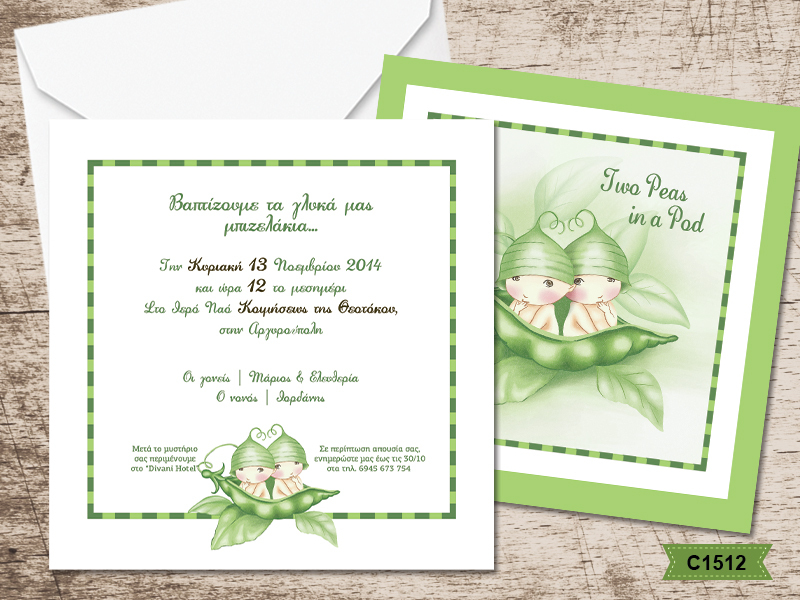 Gentle Christening invitations for twin babies, coming in a green light frame with interrupted green lines, and a pea with two babies. The matching envelopes are square white paper. Your personalized wording is printed also in green and black colour. Printing price: 65 euro (VAT included). Shipping cost not included. 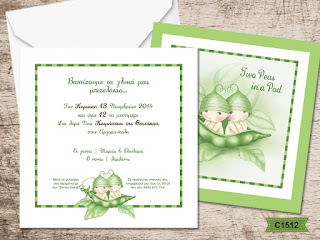 https://www.preciousandpretty.com/2017/04/baptism-invitations-with-peas-for-twins-C1512.html Greek Wedding Favors|Orthodox Crowns|Stefana|Baptism Invitations Baptism invitations with peas for twins C1512 Greek Baptism invitations with peas for twin babies. Product #: Greek Wedding Favors|Orthodox Crowns|Stefana|Baptism Invitations_4776928451522149901 5 stars out of 5 reviews.